Going Once, Going Twice...Sold to number 26. Mine, mine...all mine! Meh heh heh. 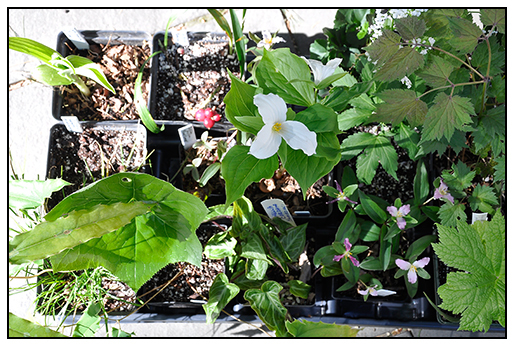 My treasures- winnings from last Saturdays rare plant auction sponsored by the New England chapter of the National Rock Garden Society. This past weekend there were many rare plant auctions in New England, and I chose one to attend ( as I had to give a talk there too!) 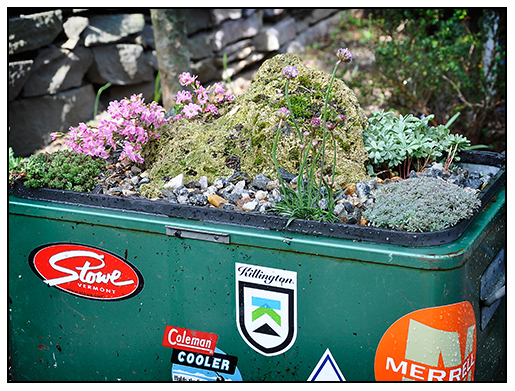 - the annual rare plant auction hosted by the New England chapter of NARGS - The North American Rock Garden Society. Held at the Assabet River National Wildlife Refuge, the event drew many for what ended up being an afternoon of fun and bidding on outstanding rare and unusual plant material. I left with a tray full of true treasures, many, not available anywhere else. 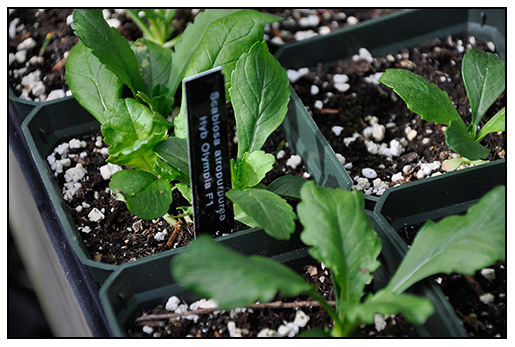 Plant societies are incredible sources for rare plants, and the New England chapter of NARGS happens to have a very impressive roster of members who often donate some truly incredible plants. 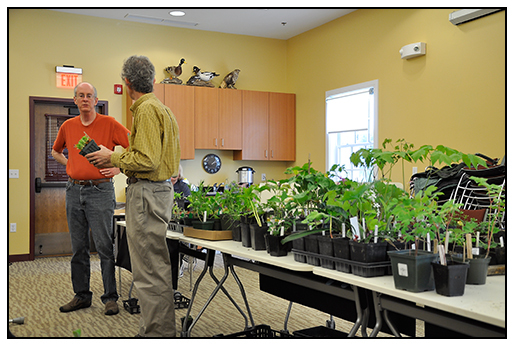 Bulb expert Roy Herold and Plant Collector Ernist Flippo entertained the NARGS membership as auctioneers at the New England chapter of NARGS annual rare plant auction. 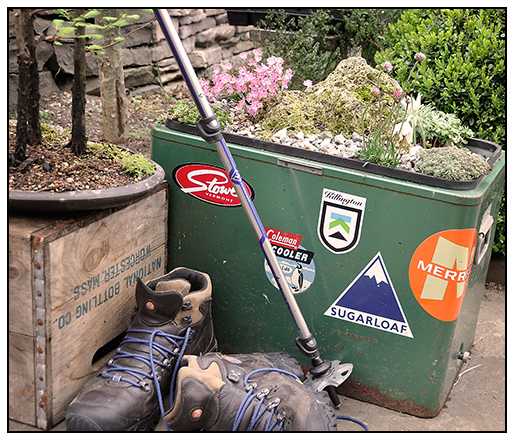 Our NARGS chapter has some notable members from the world of horticulture, some might be familiar to you if you order from such nurseries as Plant Delights Nursery where names like Hosta breeder Roy Herold and collectors such as Epimedium guru Darrell Probst, and Allium expert Mark McDonough are commonly listed. Add in some excellent nurserymen (and women) such as Russell Stafford of Odyssey Bulbs and Ellen Hornig from now closed, irreplaceable Seneca Hill Nursery, and you can see how interesting the crowd and selection could be. Plants such as these, just can't be found at any one nursery, let alone at the price which they often sell for. I purchased a Cypripedium 'Gesela' for $20.00! ( $85 at most online sources). A rarity from an explorers garden, Darell Probst offered up this rare Tupestra species, one which he has found to be hardy in his zone 5 garden. He wanted me to post to post it so that he can tease some of his collector friends who will surely doubt that it is indeed hardy in New England. Stay tuned on this one! Two strains of a miniature Trillium, Trillium pusillum var. 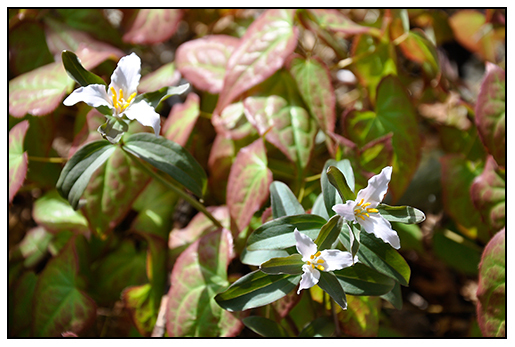 Virginianum ( above) and Trillium pusillum var ozarkanum , below. 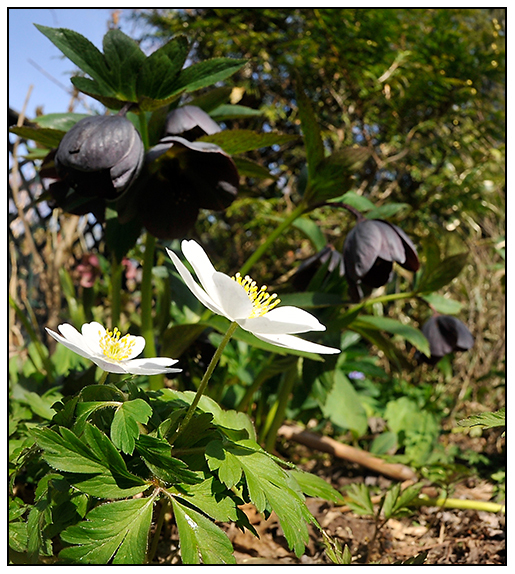 Both should spread into a mat in our new woodland ephemeral garden at the end of the long border. 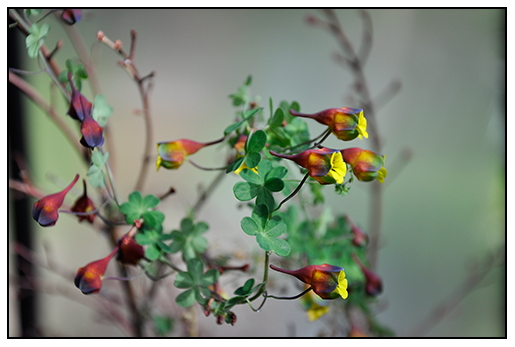 Darrell Probst gifted us with this very rare Epimedium, a species that he collected in China that is so new, that he believes that it is new to science, so it is un-named ( attr. to E. wushanense spp.). It just has a collection number right now. 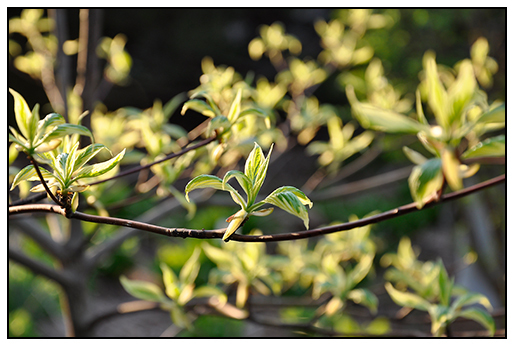 We are more than delighted, and hope that it does well in the garden. The leaves are sharp as razors. 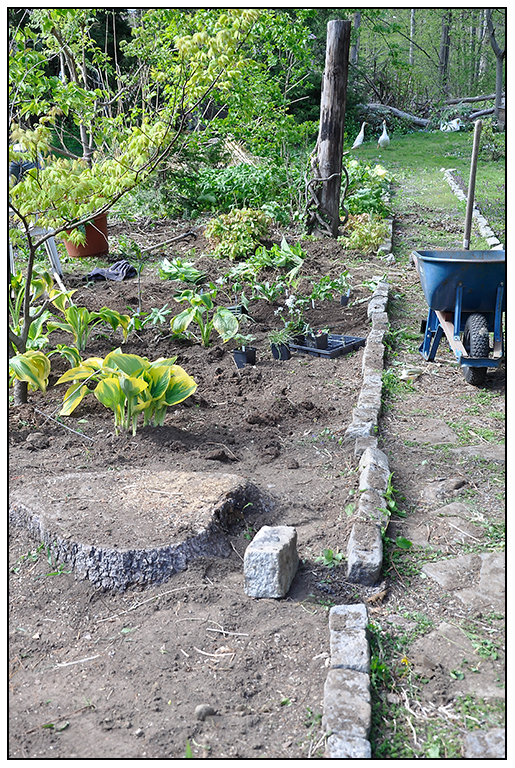 Part of our new ephemeral garden, at the far end of the garden ( see the trunk of one of the large spruce trees that we removed last year). 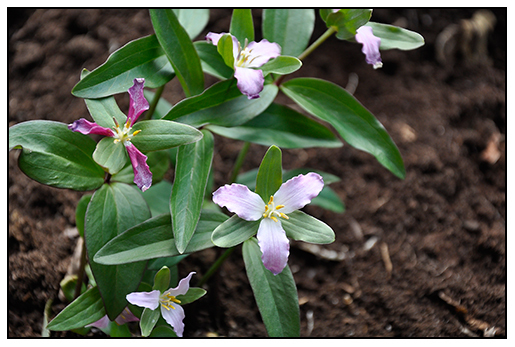 When I was a kid, this area was completely covered with trillium, so I think the soil may be perfect. 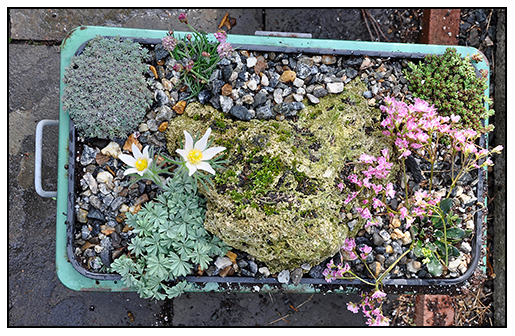 The 'California Annual' border that runs along the foundation of the greenhouse is coming along. Even though it has been very cold. 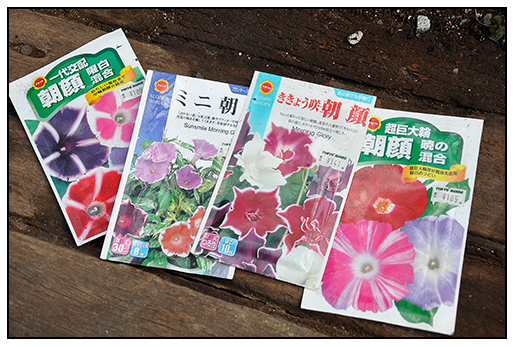 So cold, that sheets had to be thrown over the tender annuals for two nights now. 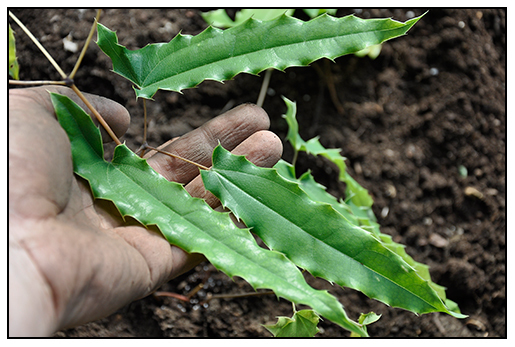 The last of the Sasa vietchii is being removed in the long border. 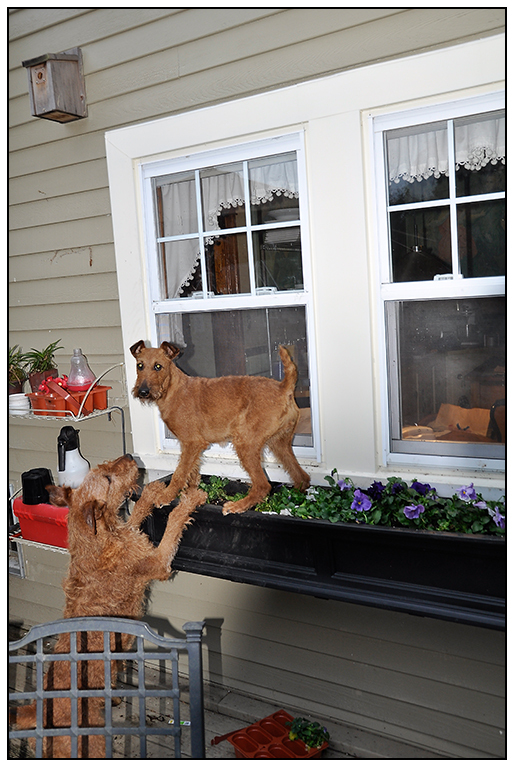 Justin, our new gardener had his job cut out for him. I wonder if he was going to return for his second day, but he did. With a few band aids. 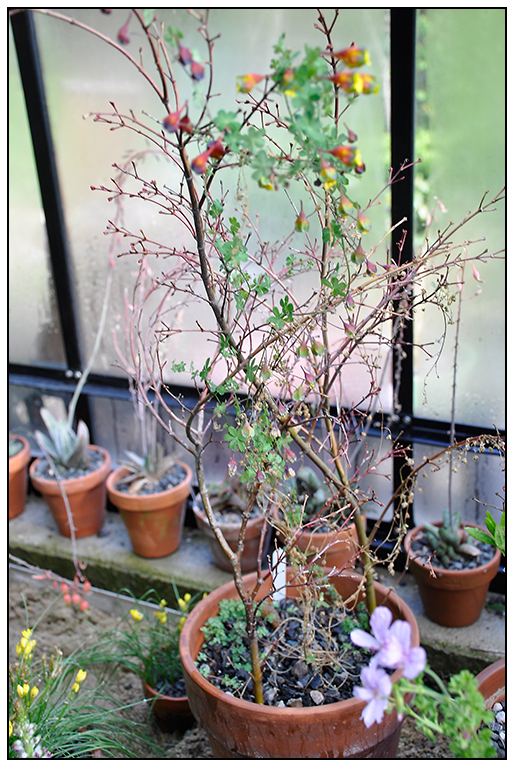 In the greenhouse, the last of the tuberous Tropaeolum brachyceras x tricolor flowers on a very spindly vine growing in an old Japanese maple branch. 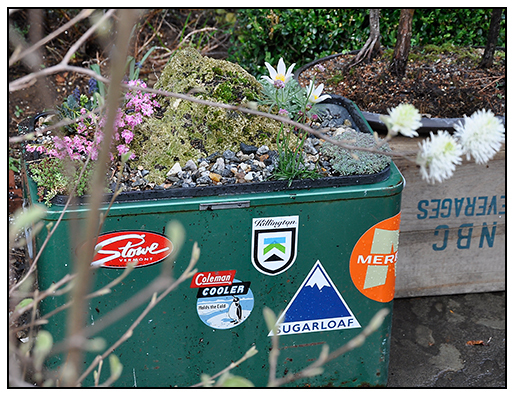 Various succulents await potting up into a large, rusty urn. 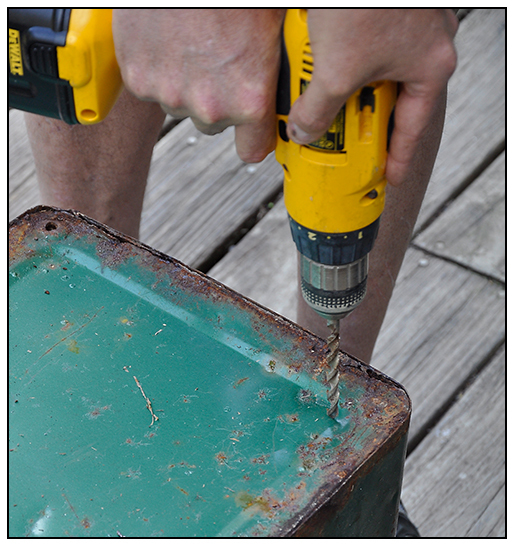 A few posts back, I listed some of my summer projects. The list is growing longer than I originally intended, which is typical with me - a little obsessive am I. There is always so much that I want to do, and yes, so little time. I find it so interesting that more often than not, the first thing people say to me when they meet me in person is " I have no idea how you make time to do all that you do!". The truth is, I don't make the time, and I often take on too many tasks, too many promises, and too many special projects. Seeing that my parents were always the same way, I think that it is genetic. Little sleep, lots of coffee, and early mornings are the key. Oh yeah, practicing a close to 100% whole food plant based diet, and running every day helps! Here then, are some of those projects that I've started this weekend. 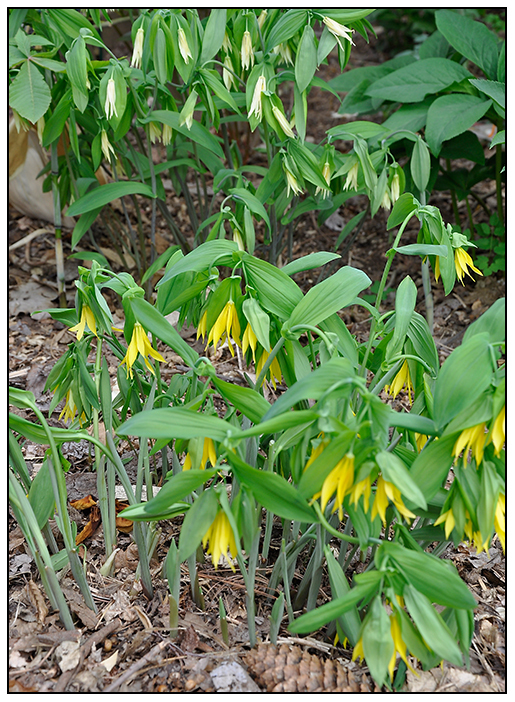 Uvularia divides easily, but use care while in bloom. 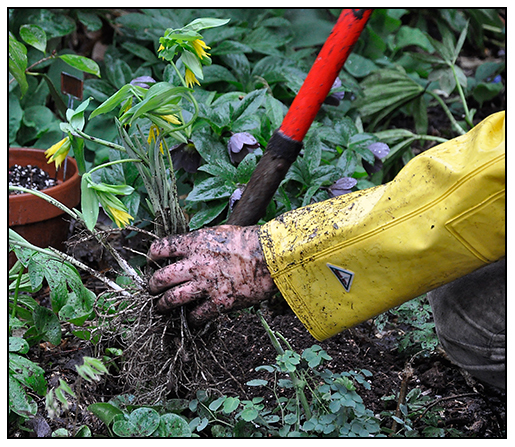 The divisions must be replanted immediately, best done on a rainy day, ensuring damp soil. Today in our garden, 3 inches of rain is expected overnight, so this was the perfect time to divide some of the more 'dividable' wild flowers in the ephemeral garden. 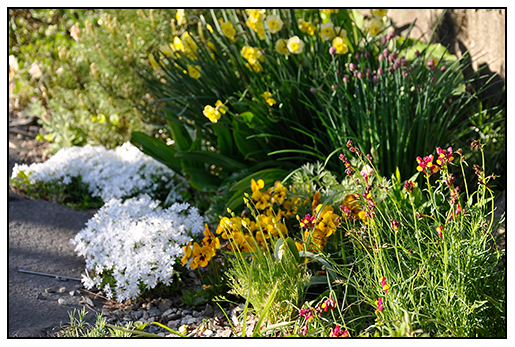 It's been such a dry spring, that the soil is like powder here in New England, but with 3 or 4 inches of well needed rain expected, this may be the only time to divide some garden perennials. 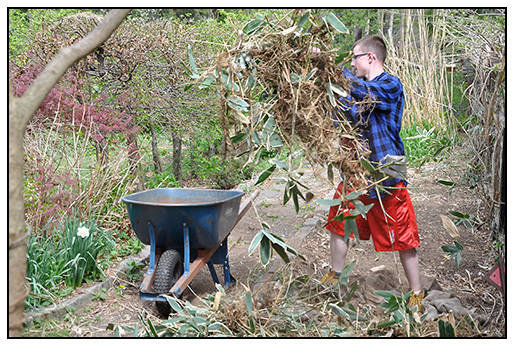 Early spring is typically the best time to divide some perennials such as hosta, daylilly, aster and phlox, the general rule being simply that to divide while to foliage is still very young, still tight buds if possible. Not all perennials can be divided now, for peony, oriental poppy insist on an autumnal division, and others are best never divided, leaving gardeners opting for more creative ways to propagate using root cuttings or seed, but when it comes to the tender and precious wild flowers, many people believe that leaving them alone to spread naturally, is the only way to achieve those sweeping drifts seen only in photos, or at botanic gardens. It's true, many ephemeral wild flowers dislike being divided, but a few transplant well, especially if the clumps are large. Care must be taken if one wants to divide in spring, for truth be told, just as the plant begins to fade for the summer, or autumn, when the plants are semi-dormant, remains the best time to dig and divide such plants, but few of us have the memory to find the rhizomes under the soil in October. Some of these plants such as uvularia and even Trillium, if they are of a clumping strain, can be divided while in growth, and even, while in bloom. 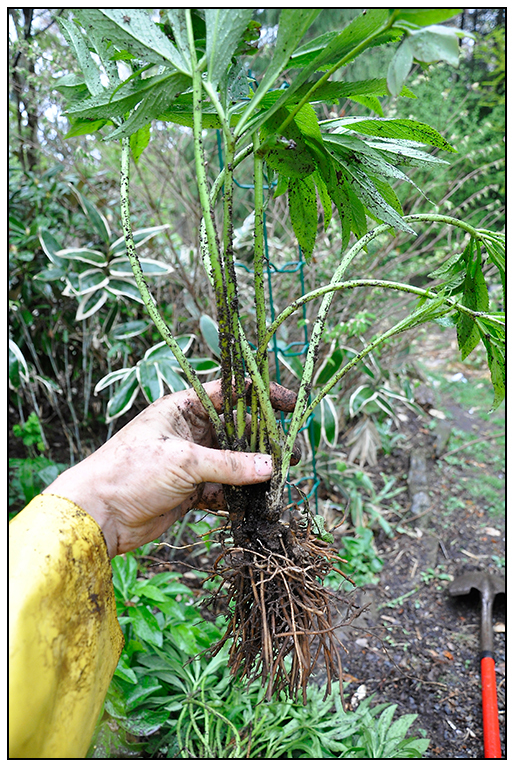 With the heavy rain and a week or two of cold weather expected, I am taking advantage of this break, to quickly divide a few plants, including a perennial hellebore ( remember - a wildflower in Europe! 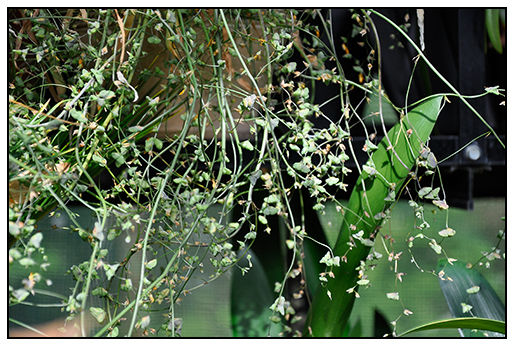 ), though not technically an ephemeral, they too can be divided if the foliage has matured enough. 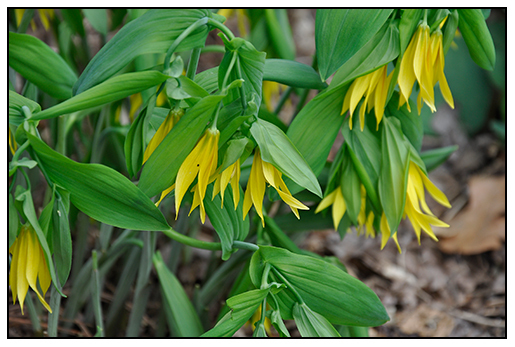 Uvularia grandiflora does indeed, have the grandest flora of the genus. It divides easily, from plants dug either while in bloom ( but you will forfeit a years' bloom) or dug and divided just after blooming. I time division based on environmental conditions, and since it has been unseasonably dry this year, our week of forested rain, is forcing me to divide plants now. Next year, I will have dozens of plants, as long as I keep 5 or 6 stems to each division. Not truly ephemerals, as they stay green year round, hellebores can be divide carefully if the weather conditions are perfectly damp and cool, so with a week of rain expected, and an early growing season, I am jumping in and digging and dividing ' a few of my larger plants in the green' as they are done blooming. 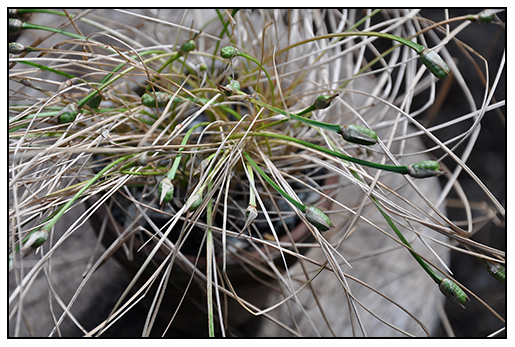 This is not ideal for the plant, and risky as a swing to hot, dry weather can prove deadly, sometimes it's worth the danger to get more plants. 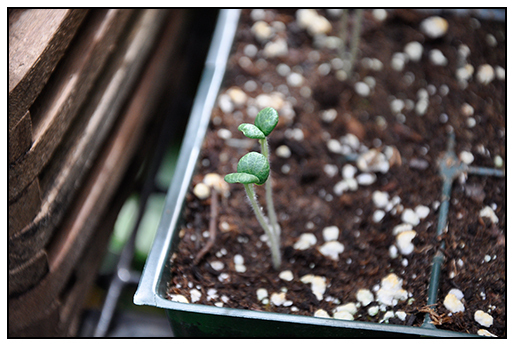 but with some faster growing strains, (which seem to be the muddier colors) it works quite well. 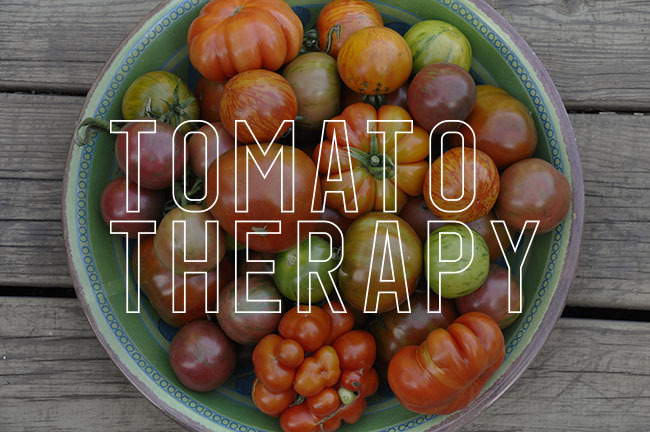 Simply dig plants up, rinse off the soil, and separate by hand, or with a skillful slice of the knife ( avoiding and drastic cuts to reduce stress and fungus), divisions of 3-5 plants can survive often blooming again the following spring. 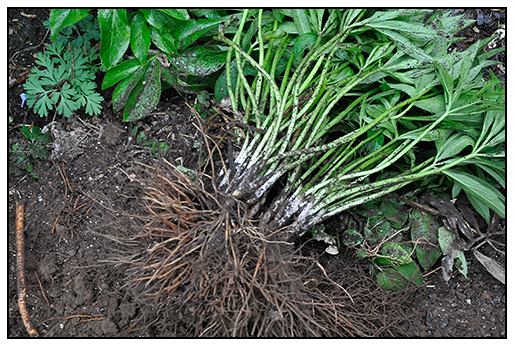 With Hellebores, try to keep divisions large enough to reduce the stress of transplanting. Here in New England, this sort of division is best done just as the foliage matures, to reduce wilting, and just as seed pods are forming. Uvularia grandiflora palida, in the rear, and U. grandiflora grow together in the ephemeral garden. 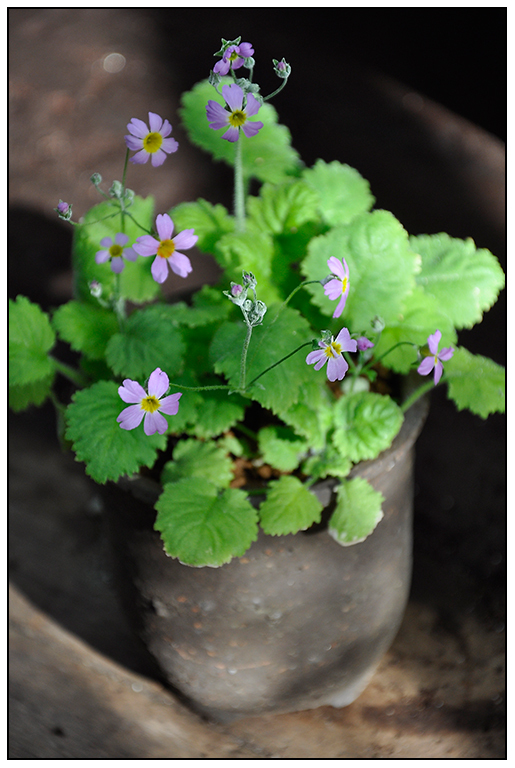 If you have a woodland garden, try to grow these delightful plants, but be certain to source form responsible nurseries and never purchase wild-collected plants, nor collect yourself from the wild. Native populations are all at risk and it doesn't matter where you live. Uvularia grandiflora is the reigning king of Uvularia. It has the largest blossoms, and, it transplants easily from divisions while plants are blooming, or just before they go dormant for the season.. I have a fondness for uvularia,it was my dad who first would point out that 'the wild oats' are in bloom". He taught me my first Latin name of a plant Uvularia perfoliata, which we kids would repeat and giggle, believing that it was a dirty name. His Uvularia perfoliata, I later discovered was actually our native U. sessilifolia or U. grandiflora ( they both have clasped leaves giving the illusion of a peforation in the leaf allowing the stem to appear to pass through it) but I never let him know that he was incorrect. It continues to grow in what is left of our woodland, if you can call it that, even though we are smack dab in the middle of a rather run-down city now. 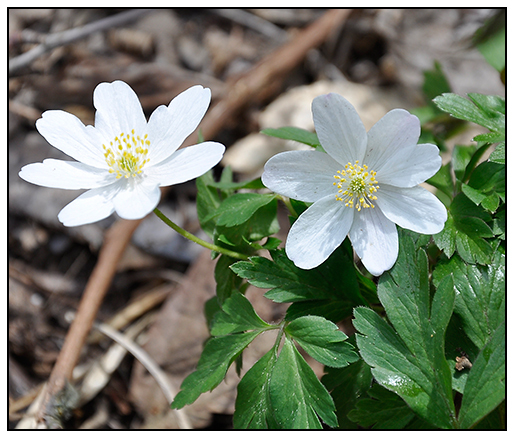 Anemone nemorosa ' Lychette', vegetative division is the only way to keep these named strains pure. The trick is finding the perfect location, for once you do, it will spread nicely into a colony.I have yet to find that spot, but I have friends who have this growing in their lawn. Anemone nemorosa, a European wild wood anemone, are all part of a section of woodland anemone that prefer rich, edaphic environments, those with spring moisture, like that found in the eastern US deciduous forests, areas that go dry in high summer, as the canopy above blocks out light and moisture. 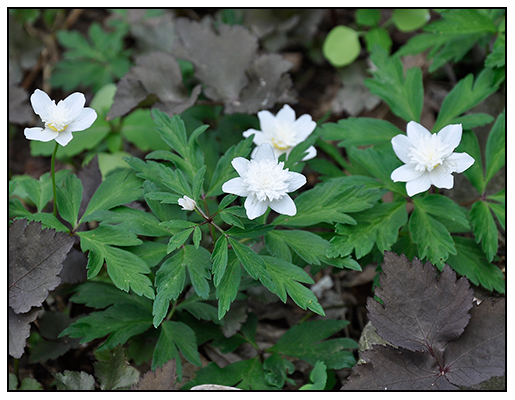 These collectible wood anemone can be divided or moved in the spring, even though they dislike it, but if you try to wait any longer, they will disappear, as they are true ephemerals. One must site them carefully, for in ideas locations, with leaf mould, no mulch they can self seed or even spread naturally. 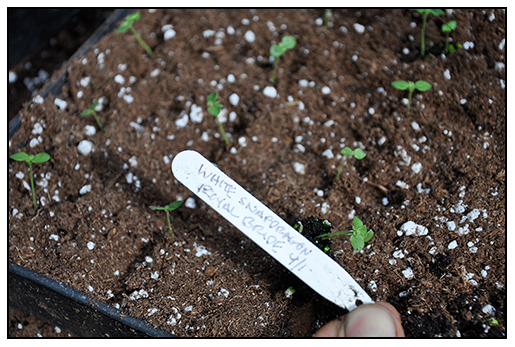 Many times, they just divide slowly, so look for seed pods ( which are only viable and ripe for a couple of days),and plant the seed in pots set into a cool corner of a cold frame or greenhouse. Some wildflowers, such as these rare Columbine (Aquilegia fragrans) which were collected on an Chadwell expedition to the Himalaya require a pre-chilling period to stratify the seed so that they will germinate properly. 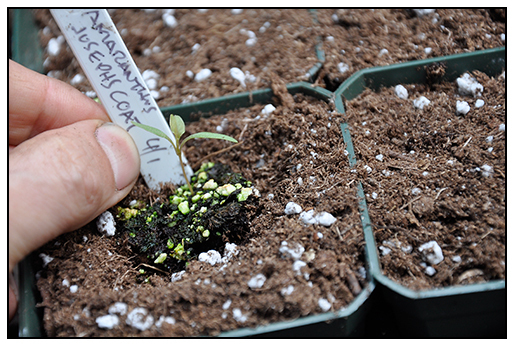 Seed raised rarities are not always easy, nor timely, but for some rarer wild flowers and ephemerals, one cannot simply divided the mother plant. 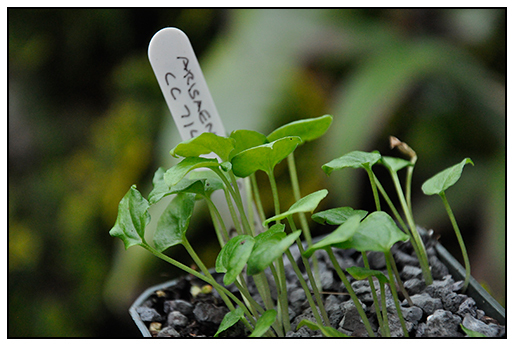 Propagation from seed provides you with more plants that you will ever need. Extras of rarites like these, will be auctioned off at botanic gardens and plant specialist societies. 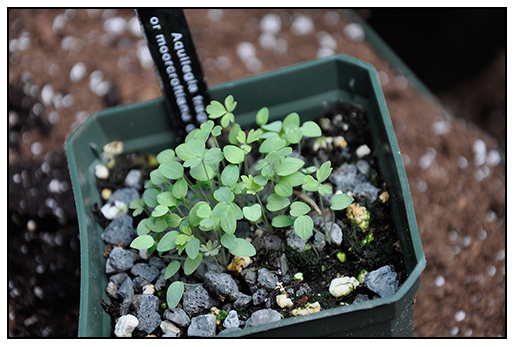 Seedling columbine ( aquilegia fragrans) are transplanted just after they start to show their true leaves, to minimize shock. 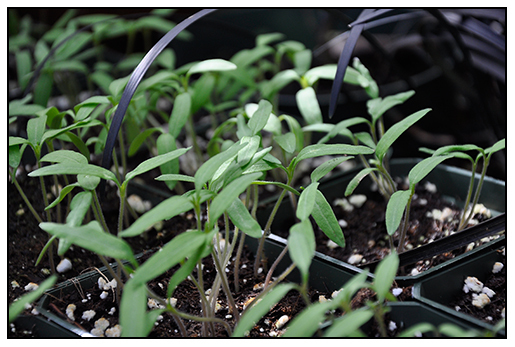 Kept in the greenhouse until mid summer when they will be planted out in a nursery bed. 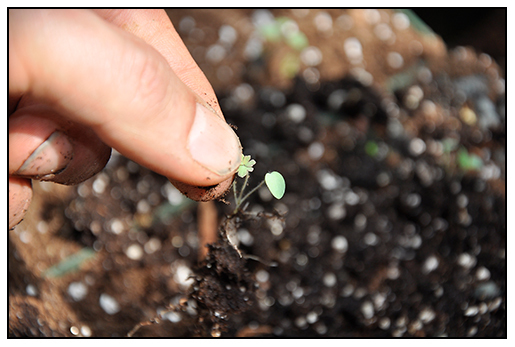 In the following spring, they can be relocated to their final growing location. 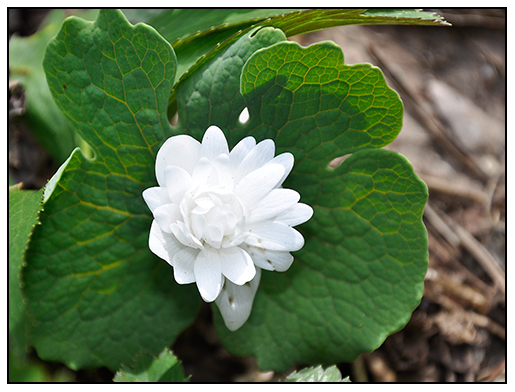 Sanguinaria, or Blood Root ( here, a double one) will divide slowly, but if one cuts the rhizome carefully early in the year, dormant eye buds may emerge. 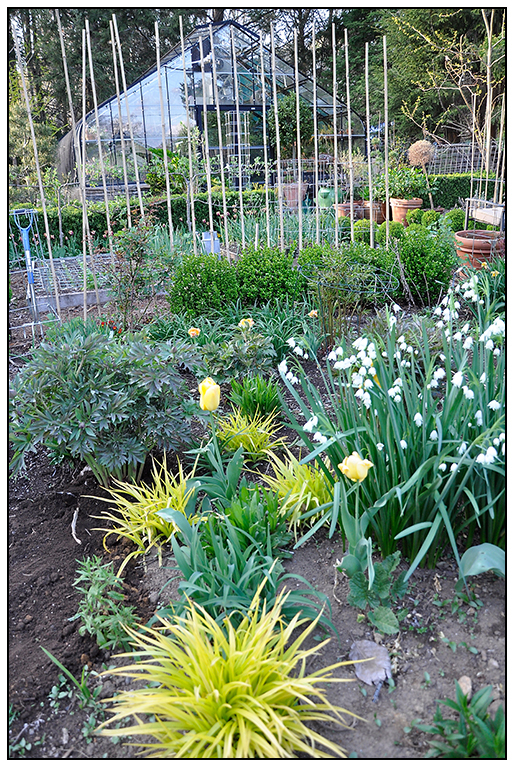 Last autumn, you may remember that I wanted to start planting larger groups of bulbs, and that instead of buying 6 or 12 of one variety, that I would limit my choices, but but many dozens of only a few varieties - a more serious way to design a garden, and indeed, the right way if you want nice sweeps of bulbs. 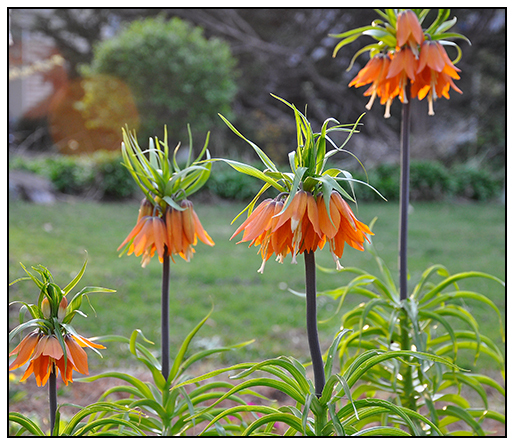 This is particularly true for the more unusual bulbs, such as these fine Fritillaria imperialis var 'Aurora', a bulb that we typically see planted alone, as a sentinel in a bed of other bulbs, but one which only recently, I discovers grows in massive sweeps in the meadows of alpine Iran, where this bulb comes from. In the wild, they look natural, yet for years, I thought that this Frits were just over-hybridized monstrosities. I purchased a dozen with the plan to buy 30 more this year, all of the same color. 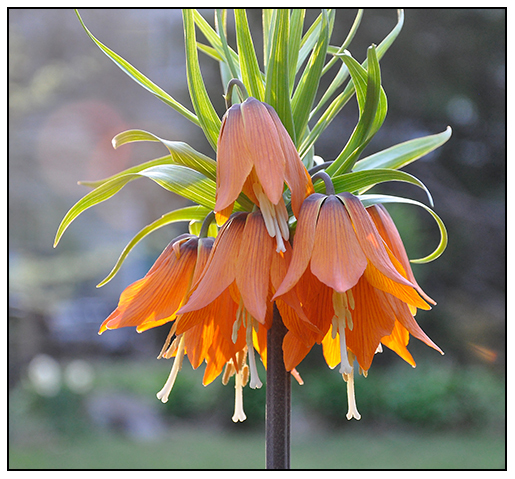 Fritillaria imperialis is available in at least 6 named selections, ranging in golden yellow to brilliant carmine red, and even a variegated form. 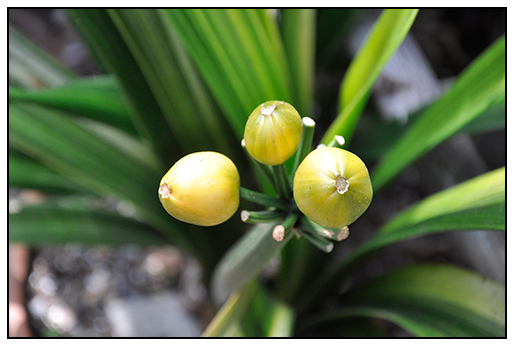 Be prepared for their scent, for every part of this bulb plant has a strong odor that drifts in the air, and one which I feel is not unpleasant, but can be interpreted as 'skunkish'. 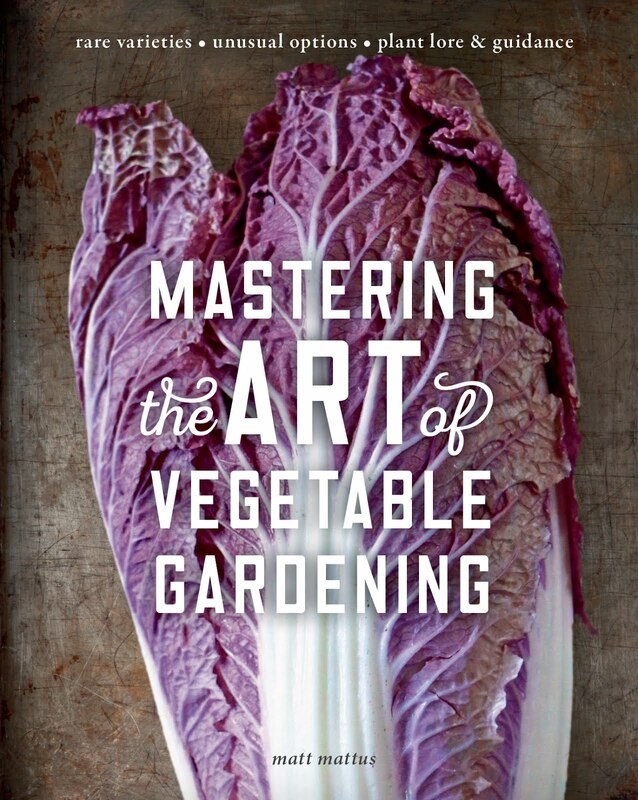 The gardening books will tell you that it smells foxy, but here in the US, that means little to us. I kind of like it. 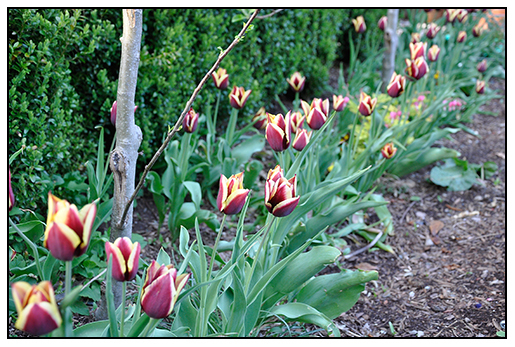 Tulips rarely look better in their second or third year after planting, but this border of triumph tulips continues to bloom, even though they are in their 4th years in this location. The variety, 'Gavota' is a fav of mine because it is almost brown, with a nice gold edge. Keeping a garden notebook is essential, if you want to remember what to order later in the season. For example, every spring, these gold-leaved Tradescantia look so nice with the few yellow tulips that I planted once in the gold and blue garden, that I need to remind myself to order lots of yellow tulip bulbs in the fall, so that this display can improve. Notice my new Itoh Hybrid peony that I just planted on the left? It was a present to myself. I needed another one ( right!). There are now four in this bed ( all yellow, naturally. 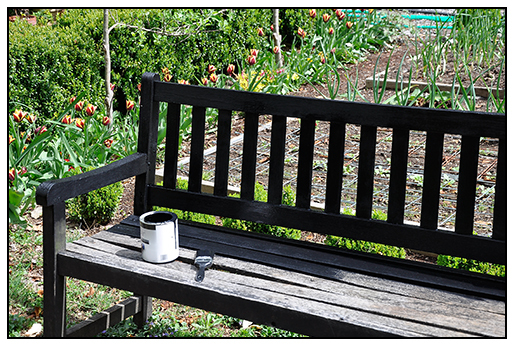 With well needed rain arriving tomorrow, I needed to catch up on some garden chores, such as painting the benches with a fresh coat of black glossy paint. I though of trying a color like a French blue, or plum, but decided to play it safe with black, besides, it matches the greenhouse enamel. 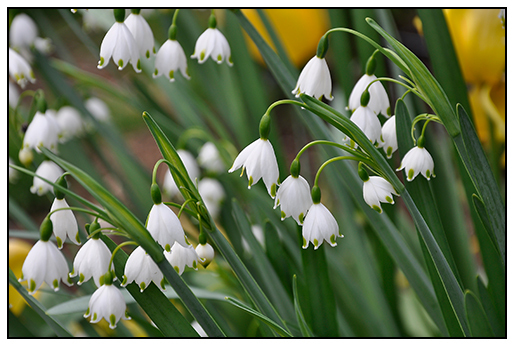 Leucojum aestivum 'Gravetye Giant' or Summer Snowflake, is one of the first bulbs to emerge for us in the spring, Shared with us by our good friend Susan, she promised that this cultivar was not only true to its name, but also, that it would divide nicely and soon would provide us with a border of these 24 inch tall snowbells. It's well on its way. Now, I was more! 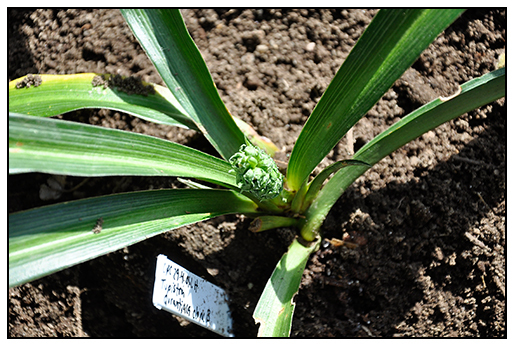 Look for these long lived bulbs in the autumn bulb catalogs, you will have them for a lifetime. Succulents await division. I am planting these in a large, steel urn again ( concentric rings, as I did a few years ago). 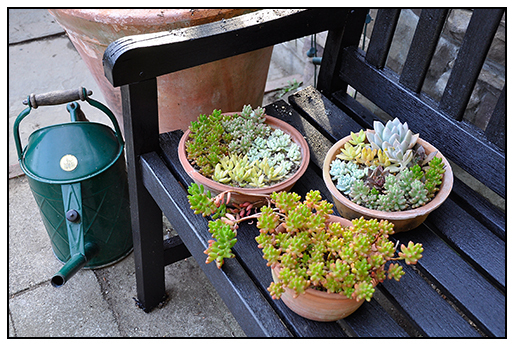 In the winter, I keep pots of succulents growing everywhere in the greenhouse, just so I can repot them in the spring into various containers. I need to make a little time each day to stroll around the garden, to appreciate the spring display, for with the heat and dry weather that we've been experiencing, each plant seems to bloom and fade in just a single day. I rarely get home from work until 8:00 pm, so I miss a lot during the week. 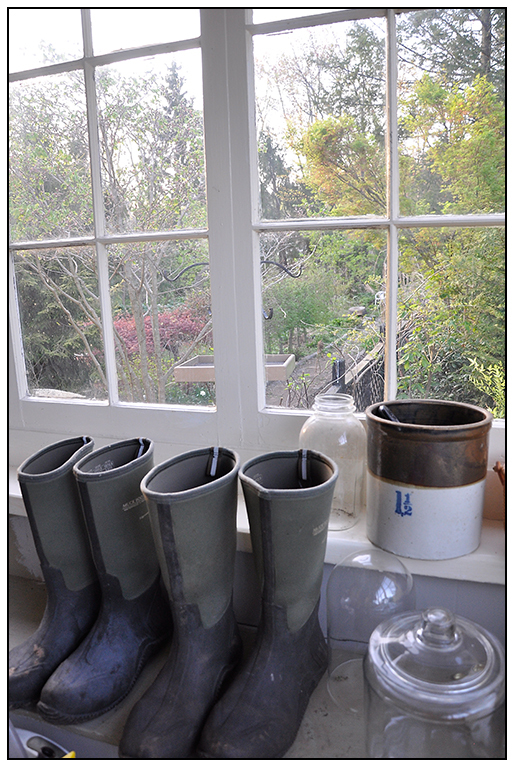 Thankfully, the weekends have been nice, although we do need rain badly. 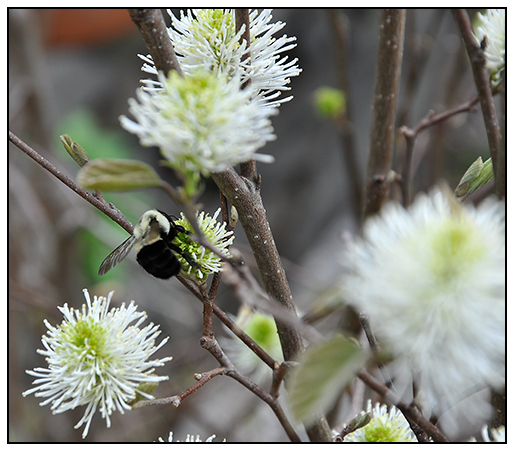 A bumblebee visits a nectar rich Fothergilla gardenii shrub, near the gravel walk which leads to the greenhouse.